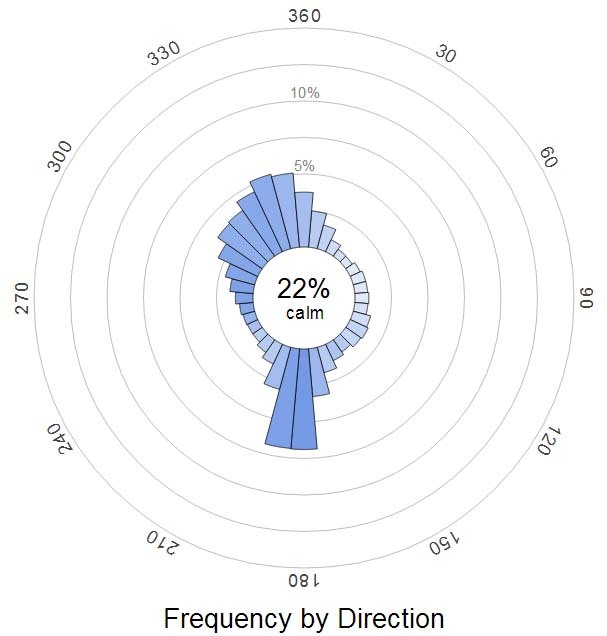 Wind rose for the Burlington International Airport. The length of the petals represents the frequency of wind from that direction (the petal extends out to the direction the wind comes from). East and west winds are rare around here. I planned to try some kite photography last Thursday, and when I saw that the predicted 10-15 mph wind was from the west, Marble Works came to mind, and would not leave. The Farmers’ Market is closed for the year, but when I arrived the open lawn was busy. The rare west wind was gusty and difficult near the ground. 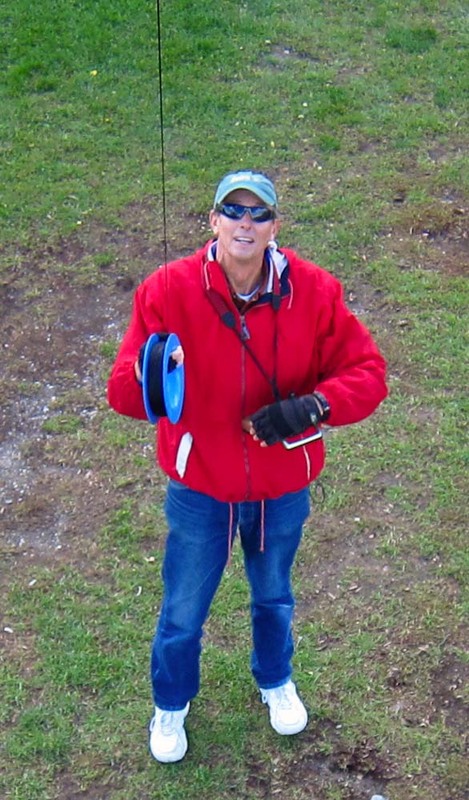 After about 20 minutes of watching the Levitation delta deal fairly well with the squirrelly wind, I attached the full RC KAP rig about 200 feet below the kite. I had radio control of panning, tilting, and shooting the Canon Powershot S95 which was set for ISO 200, 1/800 second shutter speed, -1/3 exposure compensation, and focused on infinity. 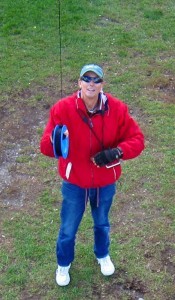 Within 30 minutes, I had 1000 feet of line out and the kite was directly over the Congregational Church, and traffic. I tried to be calm and polite to the dozen people who came up and talked to me, but my attention was locked on the kite, hoping not to see anything interesting happen. The Middlebury Green at the village center. This is stitched from nine overlapping photos. 2012 © Chris Fastie Click it to enlarge. The wind held, and was very cooperative way up there. The flight lasted an hour and the camera captured 648 photos. 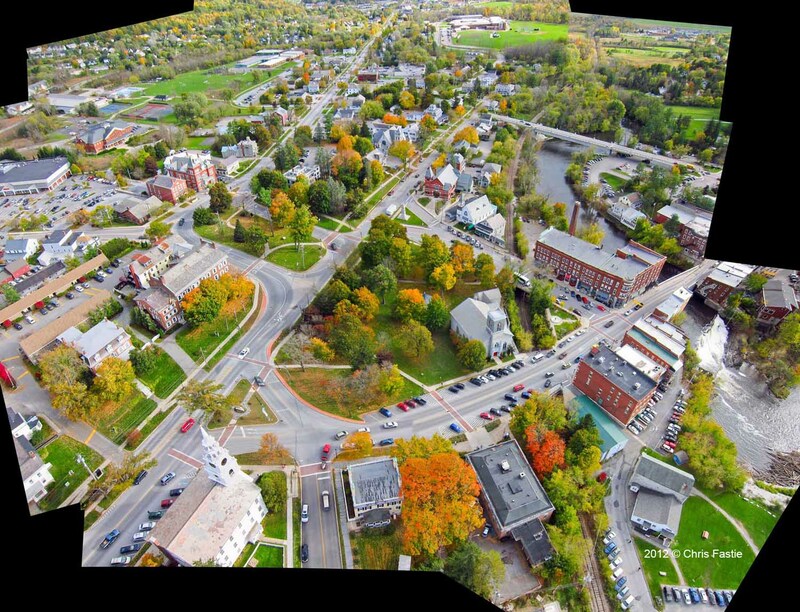 This included lots of vertical shots that I will someday align using MapKnitter into an orthophoto map. With the photos loaded in Lightroom, I started looking through the oblique images for sets that might stitch together into panoramas. I made a few using Microsoft ICE, but the camera seemed not to have stayed in the same place long enough to take many shots from the same perspective, so the panoramas were small. On Friday, I tried one big set of photos and was startled that they stitched into a 360° panorama. I quickly found a few more images that filled in the nadir and I suddenly had a much coveted (by me) half-spherical panorama. Unfortunately, I had not been careful to take enough shots tilted up at the horizon, so there are gaps in the coverage of the horizon. But the horizon never stitches together very well in these panoramas, so it is not a big loss. Below is the half-spherical panorama in a smooth spherical viewer. Go here to see it fullscreen. Below is the 360° panorama flattened out at gigapan.com. Go here where you can see it fullscreen. Below is a single photo of Main Street, which does not show up very well in the panoramas. It’s amazing how tiring it can be just standing around for an hour holding on to something that doesn’t even have any weight. I was hugely relieved when the kite landed, and quite exhausted. 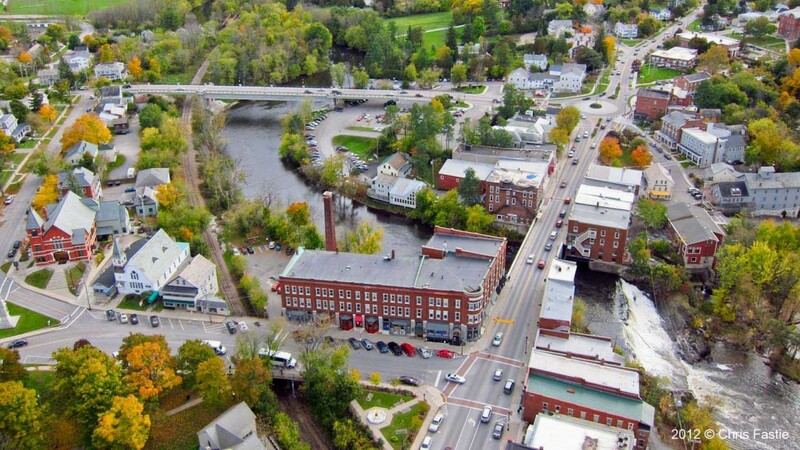 Middlebury was a mill town. Some of those mill buildings are no longer there. There were mills on the southwest side of Otter Creek upstream of the stone bridge and the falls. The brick building on the southwest side of the bridge has a tunnel for a water turbine underneath it. Below the falls the Frog Hollow building was a mill. Also there was another mill just below Frog Hollow building and the Marbleworks complex used water power to cut their marble. These were lumber, grist and stone cutting mills.